Super Booster® (aluminum construction) reel weighs up to 30% less than standard booster reel. Standard inlet: 1-1/2" 90° ball bearing swivel joint with 1-1/2" female NPT threads and 2" Victaulic® groove. Temperatures from -25°F to +175°F (-32°C to +79°C). CAUTION: When using Niedner Reeltex® hose, a special riser and/or larger drum diameter is required. Dimensions up to and including 30-31 disc size reflect pressed frames. All others are roll-formed channel frames, except Super Booster, which is square tubing. Weights in chart are for manual rewind models. Add 40 lbs. for power rewind. 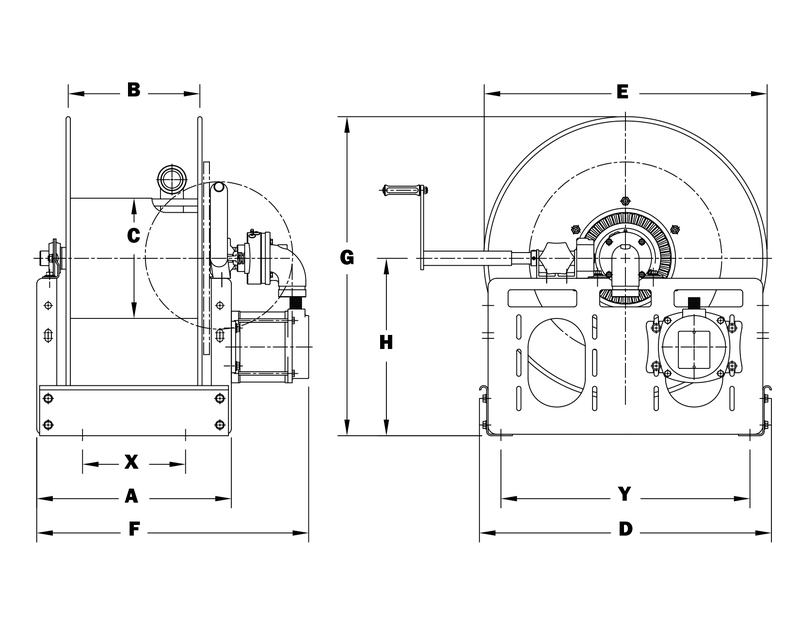 When ordering power rewind models, prefix model number with: EP = Electric Rewind (1/2 HP); A = Air Rewind; HD = Hydraulic Rewind. Air rewind reels are supplied with control valve and 18" air hose; 12v and 24v DC rewind reels are supplied with switch and solenoid; 115 v AC rewind reels are not supplied with switch, but can be ordered separately; hydraulic rewind reels are not supplied with control valve. For polished aluminum reels, prefix complete model number with "SB", for example: SBEPFF28-23-24.